I met with and interviewed 7 different officiants before making the best choice: Reverend Ana. 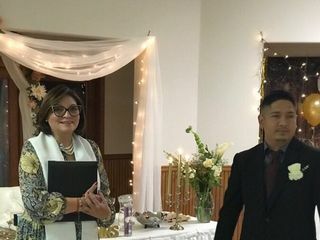 The ceremony was the MOST important part of the wedding to us and Reverend Ana was the perfect officiant to help us make our ceremony special. 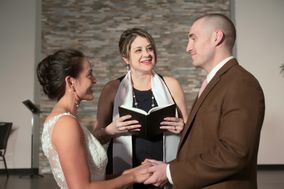 I would consider myself spiritual and our families have varying religious backgrounds so it was important that we choose an officiant that could resonant and speak to everyone’s heart, no matter the religion. When I first spoke with Reverend Ana on the phone I knew immediately that we needed to choose her. I will be forever grateful that I followed my heart (and gut instinct) because she is amazing. She let me be involved in planning the ceremony and we worked together to make it extra special and personal to us. She spent time getting to know us and she was always responsive, which is critical when the stress of the wedding gets to an all-time high. She is decisive, articulate, graceful and has this energy that somehow touches everyone’s heart. We had numerous guests tell us that the best part of the wedding was the ceremony (I even had an aunt ask for Reverend Ana’s name and number so she could book her when she renews her vows). Everyone cried happy tears during the ceremony (even our photographer pulled me to the side to say the ceremony touched her so much that she cried too). Do not underestimate the value of the officiant. 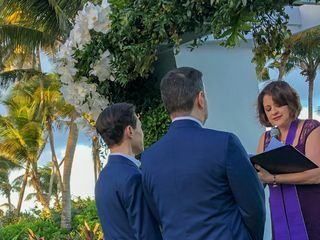 They set the tone for the ceremony and have the ability to make it a beautiful and sacred space, which is exactly what Reverend Ana did for us. I recommend her 100%. Rev Ana was very understanding about how we wanted our wedding ceremony done. She added something special to the ceremony and I got more than what I expected out of it. She helped make the ceremony very rememberable and better than what I planned. The first time we spoke to Reverend Ana over FaceTime some weeks before our wedding, we sensed her warmth and compassion. She had a genuine desire to get to know us and asked sincere questions about our relationship and the voyage towards marriage. Our first conversation with her sealed the deal, and she agreed to officiate our non-religious ceremony. Rev. Ana was flexible as we did not reach out to her until three weeks before the wedding. 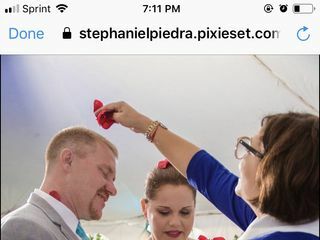 Although she would have to travel from the mainland to Puerto Rico, within days, she had booked travel and arranged to be there a few days before the ceremony in order to ensure her presence and attend the rehearsal. The Reverend was diligent in filing all the necessary paperwork for us after our service and helped us prepare those forms beforehand. 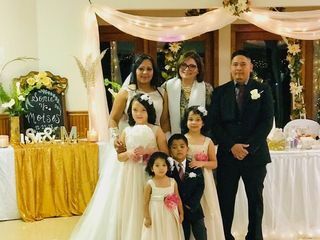 She was also flexible with the ceremony's language as she was able to seamlessly mix both English and Spanish to keep all the guests present engaged. Just yesterday as I met up with a friend after work he asked first how it felt to be married. He then told me what a fantastic job the officiant had done and how heartfelt and sincere it all felt. Six weeks after the event Reverend Ana's words and her beautiful voice still resonate in his head as it did with everyone there that evening as they continually asked how we found her. She continually told us what an honor it had been to be part of our ceremony, but as I look back and remember her voice, her words and the real emotion in her eyes the honor has been all ours. We could not recommend an officiant any more wholeheartedly. Divininamente dirigido! Gracias Dios por cruzarnos en el camino! Siempre le digo a Dios....que sean las parejas que me toca hacer....y así llegaron ustedes! That long-awaited day arrived and thank God everything went well and very beautiful ceremony thanks to the reverend Dinora for her love and delicacy with which I carry every moment of the ceremony of our ceremony ... Thank you very much we hope that I celebrated many more weddings Just as beautiful as ours ... The newlyweds José Zelayandia and Sonia de Zelayandia. Tobit and Viviana...what a beautiful review, beautiful people! I am honored and blessed that God got us together! All the best in your new life together. Felicidades! We received so so many compliments on her ceremony was so special,personal and beautiful! Rev. Ana was amazing!! Everyone who attended kept telling us how beautiful the ceremony was and how inclusive everything felt since it was done in English and Spanish. I’ll be recommending her to everyone o know! Thank you Maria and Ricardo....I really enjoyed doing your wedding very much. It is an honor to officiate a ceremony for people like you! Felicidades! Rev Ana was just the person I was looking for. There was a perfect balance of religion/spiritual and your common wedding ceremony. 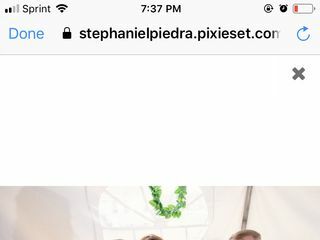 She was very professional and I would highly recommend her for your wedding especially if your looking for someone who is bilingual. She incorporated the sand ceremony along with her special blessing with rose petals that tied everything together. La Reverenda Savignon fue excelente. Ella capturó lo que mi esposo y yo deseábamos como ceremonia de bodas. Fue una ceremonia muy bien ejecutada la presencia de Dios se hizo sentir. Los invitados y familiares quedaron conmovidos ante tal ceremonia de bodas. Not only did Mauricio and I love the ceremony but my guests also commented on how wonderful it was! I loved how you added unique little touches such as the sprinkling of the rose petals which made the ceremony even more special to us. The vows were also beautifully written and it seemed as if they were written for us! I also appreciated how calm and organized you were which made Mauricio and I feel at ease. You and the coordinator Susie also worked great together as a team and you both made our day very special! Thank you so much! RevAna was a pleasure to work with. Not only is she a wonderful person with the most beautiful personality, but she created the most thoughtful, bilingual ceremony. Our wedding guests were so pleased to had witnessed such meaningful ceremony and we will forever cherish those beautiful memories. We are extremely grateful to her and we recommend her without any reservations! Ana is absolutely wonderful! She performed a beautiful wedding ceremony for my husband and I that we will never forget. Ana is so calm and collected too. She makes you feel at peace. She is also very prompt in all of her respones. We highly recommend Ana as a wedding officiant! Stop looking and contact her! Rev. Ana did a fantastic job. 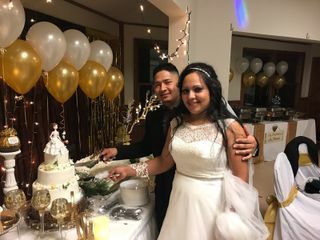 Our guest were majority bilingual, but for those that only understood Spanish or English, she did a great job incorporating both languages in the ceremony. We couldn’t have asked for better service on such a special day. Ana was a pleasure to work with. Our wedding was far from traditional and she was willing to work with us to create a ceremony that was tailored to our style and mix of beliefs. We received many compliments from guests on what a wonderful speaker Ana is and would absolutely work with her again. If you need a wedding officiant Mrs. Quintana is the one! Her speech was beautiful and heart warming. She was professional and on time; with all her words and the ceremony I had lots of tears of joy. The blessing that she does with rose pedals is extremely remarkable. Thank you so much Mrs. Quintana for making my wedding so memorable. My husband and I are very grateful for your work. Ana did a fantastic job! She went above and beyond for us. Even when we forgot or marriage license. She waited after the ceremony for us to retrieve the license and married us again!! Ana performed a beautiful ceremony, you won't regret her. Ana was the absolute best! She is so sweet and listens to all of your needs. Extremely easy to get along with and very genuine. Ana made sure this would be a special day. Beautiful and touching messages. We had so many compliments on our ceremony. She has a great way with people and bringing everyone together. OMG!! Estoy sumamente agradecida con la Reverenda Ana por haber hecho mi día el mejor de todos. Es una persona con un don tan especial que me hizo sentir como en un cuento de adas. Es tan hermoso cuando una persona como ella esta a cargo del servicio para unir dos almas que se aman. Bendiciones. 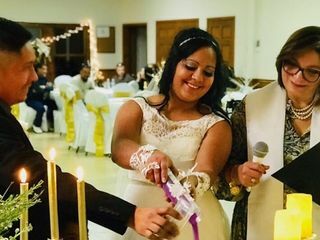 Ana was the officiant at our daughter's wedding on April 22, 2017. One of the reasons we sought out Ana to begin with were her bilingual skills - the groom is French and the bride American - and she carried that out flawlessly switching between French and English throughout. However, we found Ana to be much more. She was very warm, approachable and flexible. She immediately felt like a member of the family, and made the ceremony very personal. We wanted to blend some cultural traditions into the ceremony, and Ana was very skilled at incorporating our desires into the proceedings. Even if we had not needed her language skills, we could not have chosen better than to have our ceremony conducted by Ana. Her gift to us was a heartfelt, warm and joyous event, and we will always be grateful to her. We were planning our wedding from Ohio, Rev. Ana was very helpful even going as far as to facetime our pre marital counseling. She resided over a beautiful and loving ceremony. Reverond Ana was amazing! Honestly we let her know about 2 1/2 weeks out from our wedding that we wanted to have her as an officiant and even with such short notice she made sure to set up a meeting with us through FaceTime to discuss everything before hand. Also, I mentioned that I wanted to have a memorial inserted for my father who passed and she not only put it in the ceremony but it flowed so perfectly. From the words to the blessings everything was perfect. We wanted a bilingual service which can be hard but she did it all so well! Both of our families felt included and understood what was happening! I would highly recommend her. Then you should use Ana. I had nothing but a great experience with her and was super pleased.